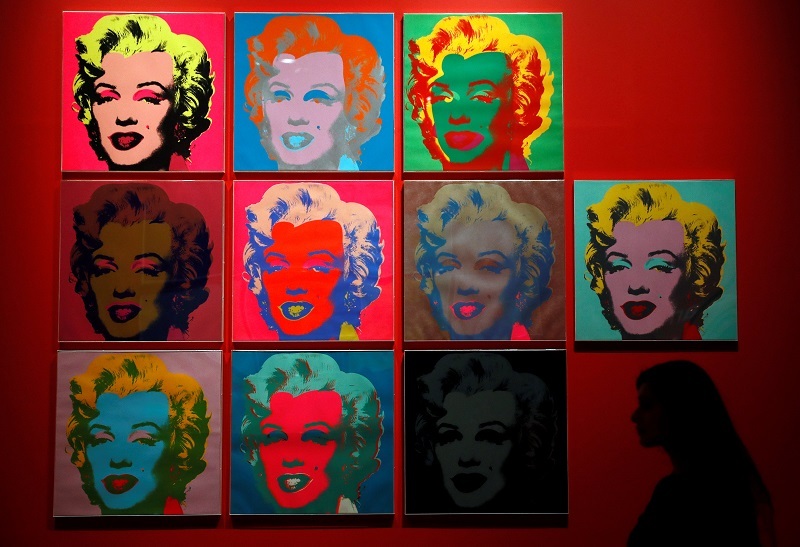 The British Museum is exhibiting recent additions to its print collection that celebrate contemporary innovations in the medium. 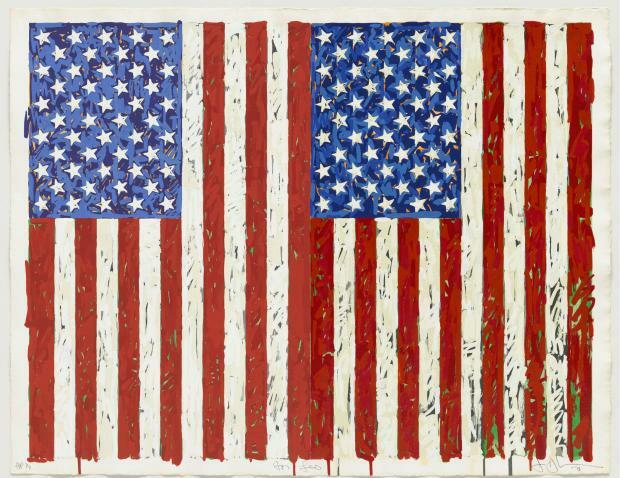 ‘The American Dream: Pop to the Present’ presents a rich display of different US artists’ work from the last half century, beginning with the expected Warhols and Rauschenbergs before turning to the experimentations of Conceptualists and Minimalists – and also engaging with the political and social use of printmaking. The range of techniques is fascinating and impressive. 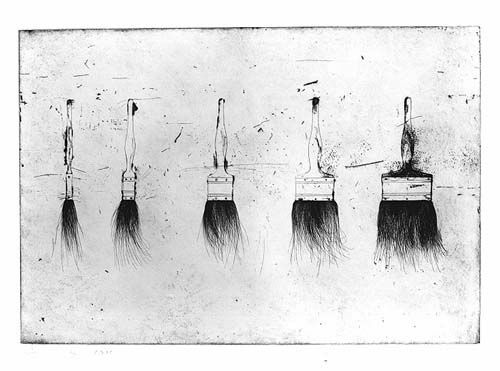 Alongside the instantly recognisable ‘Flags I’ (above, 1973) by Jasper Johns – though here in screenprint form, using thirty-one different screens to create a pseudo-painterly effect – Jim Dine’s series of etched Paintbrushes (above, 1973) are more subtle, but full of charm with their dancing bristles against an ink spattered background that epitomises the debris of the creative process, the artist’s studio. Ed Ruscha’s slick and witty screenprints – such as the iconic ‘Standard Station’ (above, 1966) – and his lithographs ‘Made in California’ and ‘Ooo’ which experiment with dripping pigment onto the stone plate to create colour saturated words in space, comment on the advertising and consumerism of sixties California. The woodcut or linocut may seem a more primitive printing method in comparison but the results are no less distinctively modern. 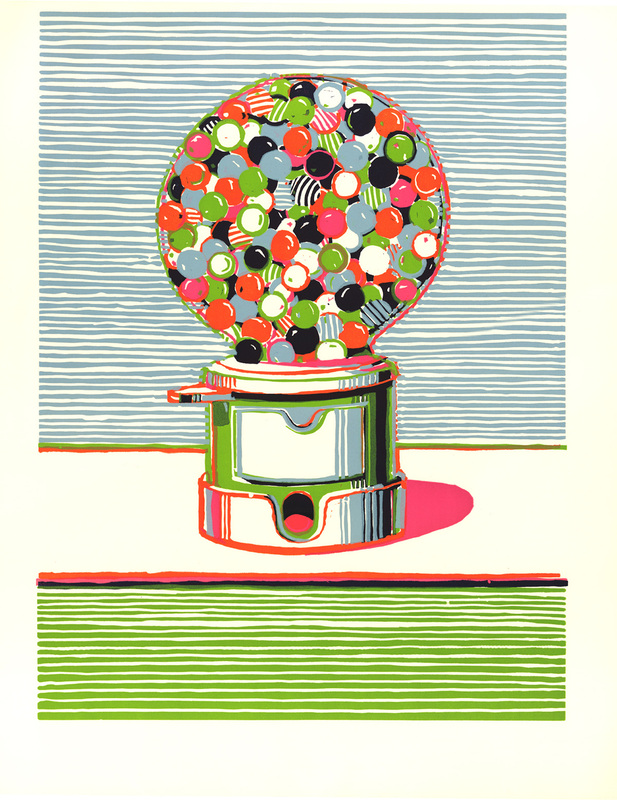 Wayne Thiebaud’s ‘Gumball Machine’ (above, 1970) celebrates another ubiquitous Amercian consumerist icon, while further on in the exhibition Vija Celmins’ ‘Ocean’ (below) – a woodcut which took the artist a year to create – is so accomplished that one has to peer closely to convince oneself that it is not a photograph. Beyond the minimalism of Donald Judd et al, we return to figuration and an interesting series of portraits by Chuck Close who experiments with paper pulp in his portrait of Keith Hollingworth (1981); the features are formed from a grid of small round pieces of dyed paper pulp in varying shades of grey. 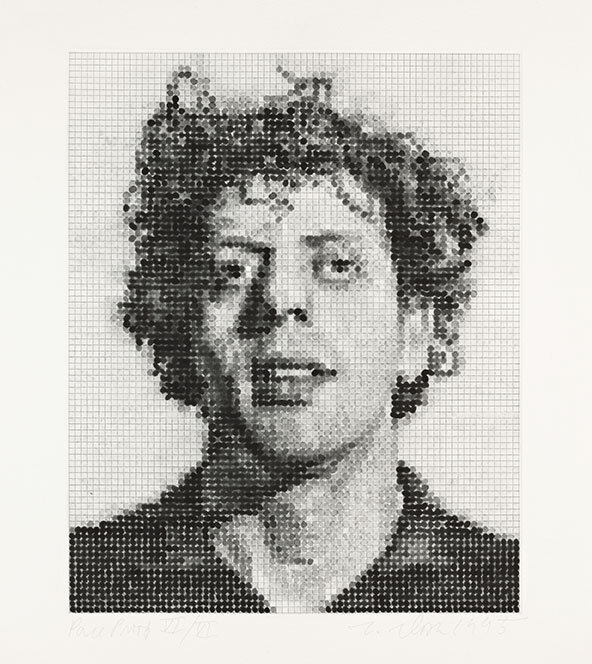 A similar technique is used in ‘Phil Spitbite’ (below, 1995) – a portrait of composer Philip Glass – with the squares of the etched grid each filled by spitbite aquatint. Another portrait of Keith, ‘Keith/mezzotint’ (1972), reinvents the antiquated method of mezzotint, rarely used since the 19th century, which involves rubbing back or burnishing the light areas from a textured (and therefore ink-holding) metal plate. Close was so pleased with the cumulative effects that this technique revealed that he allowed the grid guide to remain and this fed into his later work. 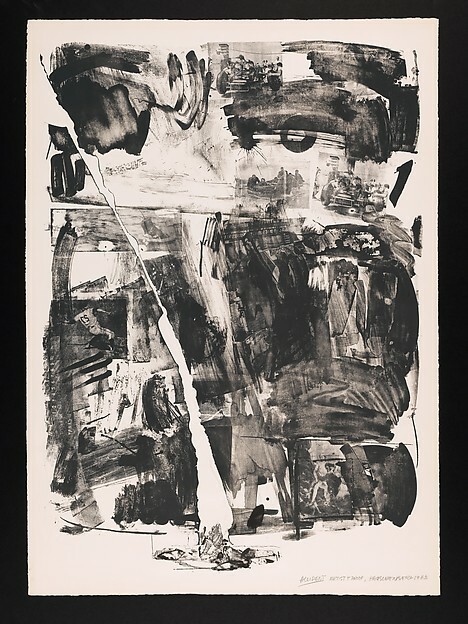 The accidental, revealing the hand of the artist or the flaws in the materials, was embraced by others too; indeed, ‘Accident’ (below, 1963) is the title given to one of Rauschenberg’s famous lithographs displayed here. 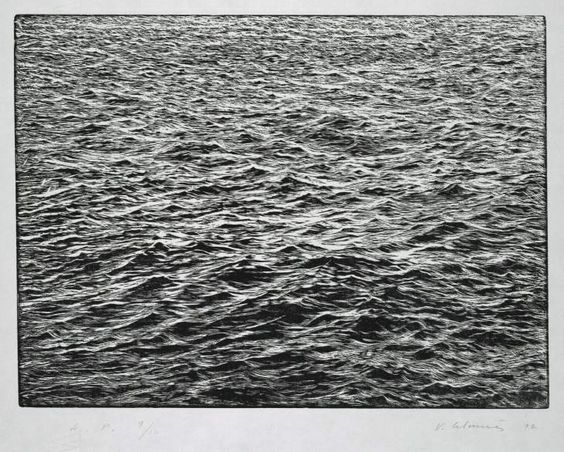 Producing some of the largest ever single plate lithographs – notably his magnificent ‘Booster’ (1967) and ‘Sky Garden’ (1969) – his ambition at one point got the better of him and the lithographic stone broke in the printing process; Rauschenberg not only made this a feature but even added some stone chips at the bottom to exaggerate the effect. 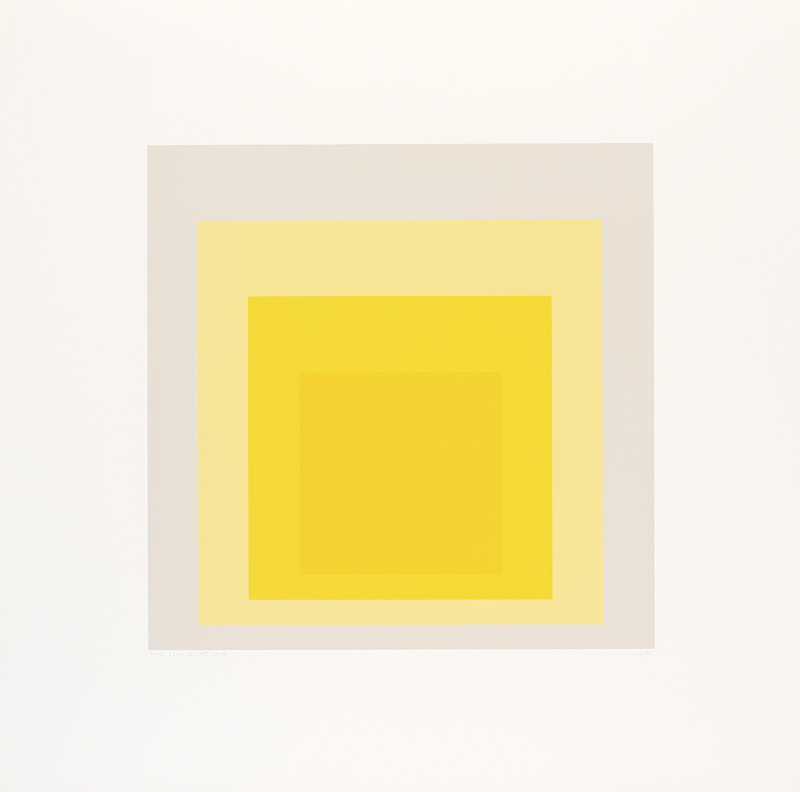 What impresses elsewhere – in the massed ranks of Marilyns or electric chairs by Warhol as well as in the careful, pale geometricism of Josef Albers (below) – is the exceptional choice of colour juxtaposition. For all their brazen simplicity, the effect is striking, beautiful and perfect. 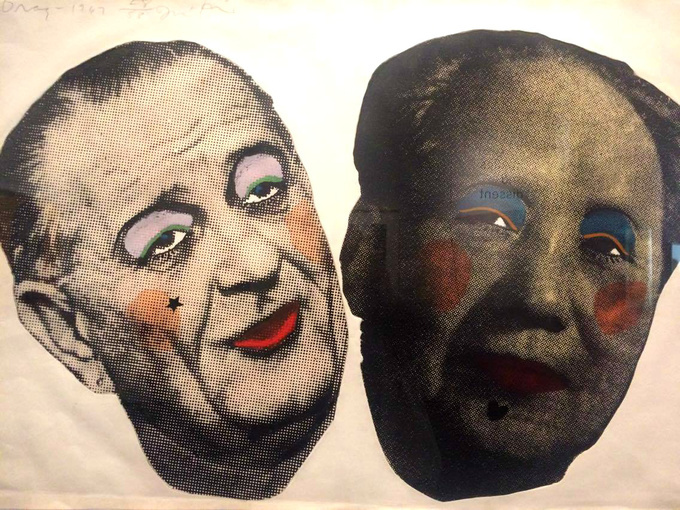 The second part of the exhibition addresses the political, both serious and satirical, from Jim Dine’s photo-etching with stencil colour ‘Drag – Johnson and Mao’ (below, 1967) to Warhol’s green-faced portrait of Richard Nixon above the scrawled incentive to ‘Vote McGovern’ (1972) and the feminist and race-related statements of Ida Applebroog, Kara Walker and Louise Bourgeois, among others, all making a powerful, unmistakable statement in the most simple pictorial terms. 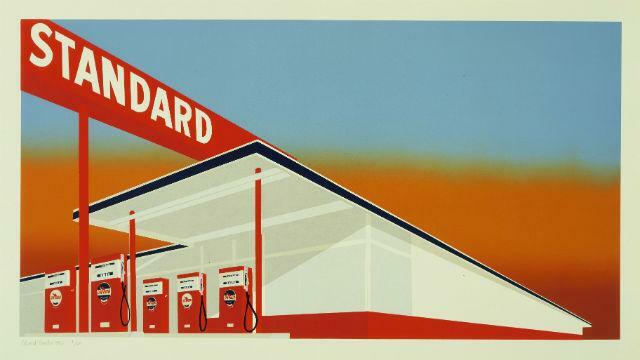 The final gallery attempts to bring us up to date – most successfully perhaps by reintroducing Ed Ruscha, whose 1960s screenprints summed up the optimism of Pop Art and the American Dream. Here, ‘Standard Station’ reappears, this time drained of colour, a simple embossed white image, a ghostly shadow of the high hopes of yesteryear. 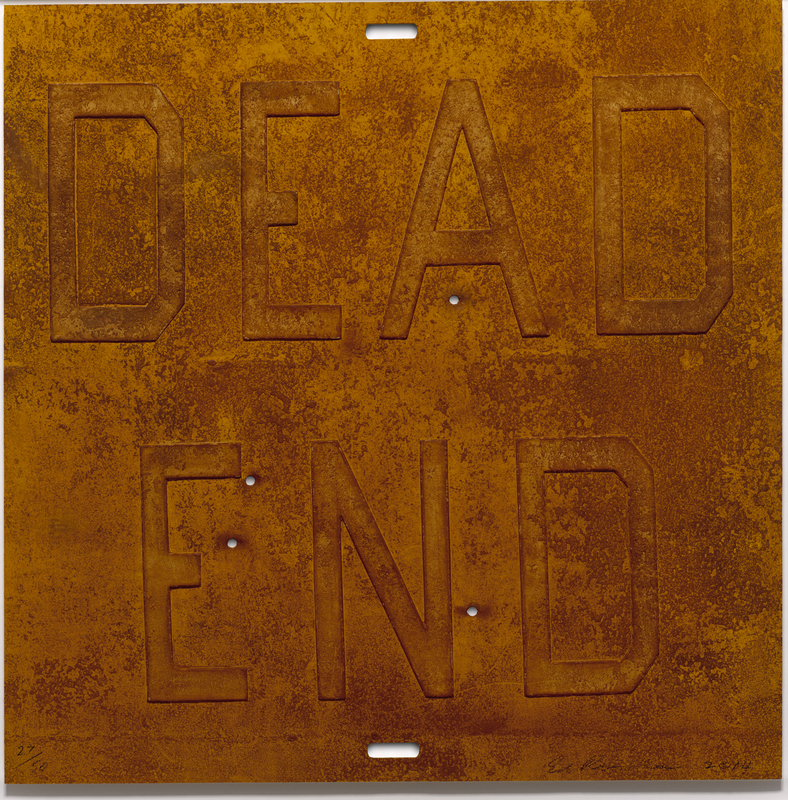 Accompanying this are a couple of rusty signs riddled with bullet holes (‘Dead End 2’, 2014) – in fact they are mixographia prints on handmade paper, another extraordinarily effective technique – that seem to spell out the disillusionment in Trump-era America.